The New Jersey Supreme Court will be addressing free-speech issues in a case involving a giant inflatable rat, after an appeals court affirmed a township’s decision to fine a union representative $133 for displaying the rat at an event. 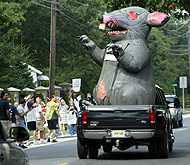 New Jersey v. DeAngelo arises from the use by members of the International Brotherhood of Electrical Workers of the inflatable rat during a 2005 protest outside a Gold’s Gym in Lawrence Township, New Jersey. (The opinion explains that the rat "is a well-known symbol of protesting unfair labor practices." The examples depicted here were used by IBEW in other cities.) Gold’s Gym called police and objected to the rat. The IBEW was ordered to remove it on the grounds that it violated a local sign ordinance banning (among other things) "balloon signs or other inflated signs (excepting grand opening signs) . . . ." They did, but the rat was back 45 minutes later, presumably after a .75-hour conference with union attorneys. Police then issued a summons to Wayne DeAngelo, the senior union official present, who was later found guilty and fined. On appeal, DeAngelo argued (1) that a rat with nothing written on it cannot be a "sign," and (2) the ordinance is too vague to be enforceable anyway. The majority, however, found that the rat could qualify as a "sign" on the grounds that it "carr[ied] a symbolic message of a labor protest," and that the First Amendment was not violated partly because the ordinance was "content-neutral" — all balloon signs are prohibited unless there is a grand opening in progress. The dissenting judge thought that more facts were needed as to whether the ordinance was really being enforced neutrally, and would have remanded the case. 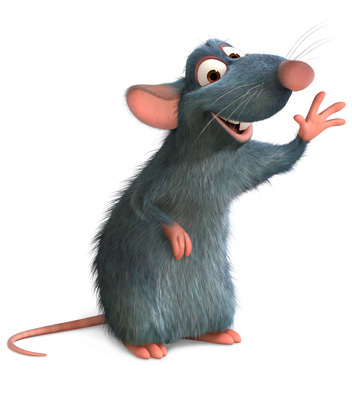 As he pointed out, had a new Disney store opened in the township, it could legally have displayed the same rat right next door, under the "grand opening" exception, as a symbol of its movie, "Ratatouille." Well, maybe not the same rat, but an inflatable rat of some kind. Because there was a dissenting opinion, the defendant has the automatic right to appeal to the state supreme court, and says he will do so.